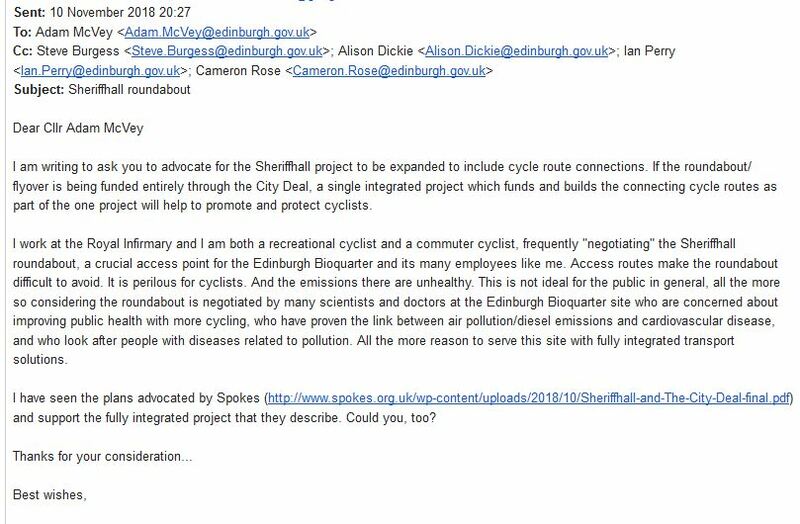 It is difficult to classify some projects by area..
For Spokes submissions on more general Edinburgh policy issues see this page. 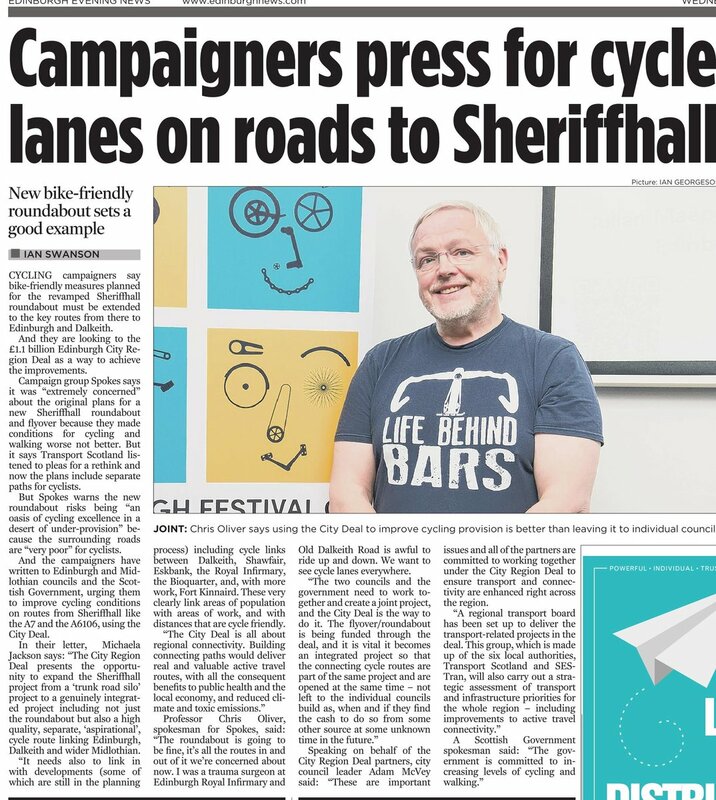 181025 Letter to Council Leaders & Transport Minister [pdf] seeking connecting cycleroutes, as part of the City Deal Sheriffhall project. Evening News article [jpg, online]. Tweet. 181103 Spokes member circular [section 7] and a typical resulting email. 1708/1710/1808 Sheriffhall roundabout The extensive pressure led to a major rethink and 2 stakeholder workshops showing greatly improved provision. Notes from 2nd workshop (Oct 2017). Worked-up cycleroute plans (Aug 2018). 1706 Sheriffhall roundabout (and trunk road projects more widely) Spokes supports petition by Michaela Jackson of Gorebridge Community Trust at Scottish Parliament Petitions Committee. [1709/1710 and 1802 – further correspondence – see National issues page, para 1706]. 1704 Sheriffhall roundabout ScotGov chooses Option B – the worst for cycling. Spokes letter to Transport Minister. Government reply. Our website story and tweet. Sustrans response. Sustrans blogpost. We continually use Sheriffhall as an example of trying to fit cycling in after the main decisions taken – example1 [p5]; example2. 1612 Sheriffhall Roundabout Government consultation on options Consultation leaflet [pdf 7.5MB] Spokes response. Sustrans response comparing the 3 options.